Being in Common invited people to expand and alter their understanding of ‘common space’ and built on Proboscis’ continued engagement in the social, cultural and natural histories of sites and territories. 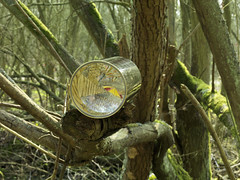 It explored notions of kinship and belonging as well as those of property and ownership so connected to the meaning of ‘common’ in the English language and in Anglo cultures. 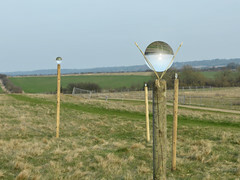 Inspired by the physical boundaries of the site and the close connection between the histories of enclosure, surveying and gunpowder that coincide in Gunpowder Park, Proboscis created three works which were sited in specific locations within the park. Through the use of optics, mirrors and viewmasters, visitors were invited to experience a different perception of their environment. 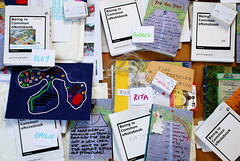 As part of Proboscis’ process of artistic research, Exploration Packs were sent to a number of people around the world who responded by creating their own perspective of what ‘common space’ means. These will be exhibited at the Field Station. Accompanying these works is a Catalogue of Ideas, a pack of playing cards which playfully draws together, in 13 themes, imagery, writing, material from the Exploration Packs and ephemera collected during the commission. The themes, which range from water to human rights, environment to conflict and physical spaces to media, meditate on common space and the commons. 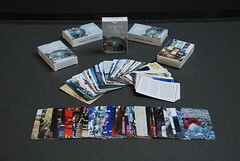 Explore the cards via the Flash Viewer. Team: Alice Angus, Niharika Hariharan, Giles Lane, Karen Martin & Orlagh Woods. Exploration Pack contributors: Tony Amaechi, Max Dixon, Gill Croft, Saffron Douglas, Myria Georgiou, Andrew Hunter, Rita J King, Joyce Majiski, Adriana Marques, Emilio García Millán, Louisa Rolandsdotter, Anupama Sekhri, Premlata Sharma, Tak Tran, Janet Vertesi, Kasama Yamtree, Nithaar Zain.